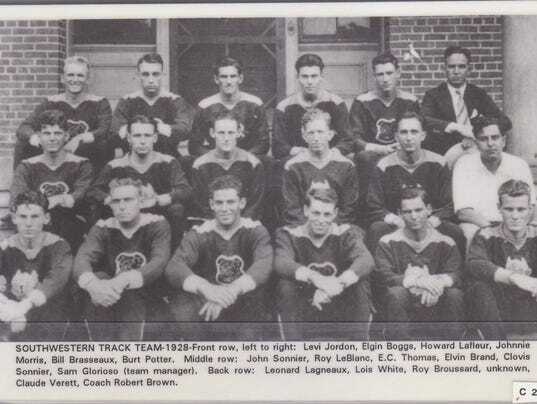 The 1928 Southwestern Louisiana Institute’s track team (front row, from left): Levi Jordon, Elgin Boggs, Howard Lafleur, Johnnie Morris, Bill Brasseaux, Burt Potter. Middle row: John Sonnier, Roy LeBlanc, E.C. Thomas, Elvin Brand, Clovis Sonnier, Sam Glorioso (team manager). Back row: Leonard Lagneaux, Lois White, Roy Broussard, unidentified, Claude Verett, Coach Robert Brown. Please click here for the Athletic Profile of Johnny Morriss, which includes letters from some of his former athletes.